As we covered last week, Democrat candidate for Congress Ann Callis and Democrat Candidate for Illinois State Treasurer Mike Frerichs have been pulled into a voter registration scandal down in Champaign. ILGOP Chairman Tim Schneider is now calling for both candidates - Callis and Frerichs - to publicly apologize for delivering this 'black eye' on what was supposed to be a wonderful, important event for high schoolers registering to vote for the first time. 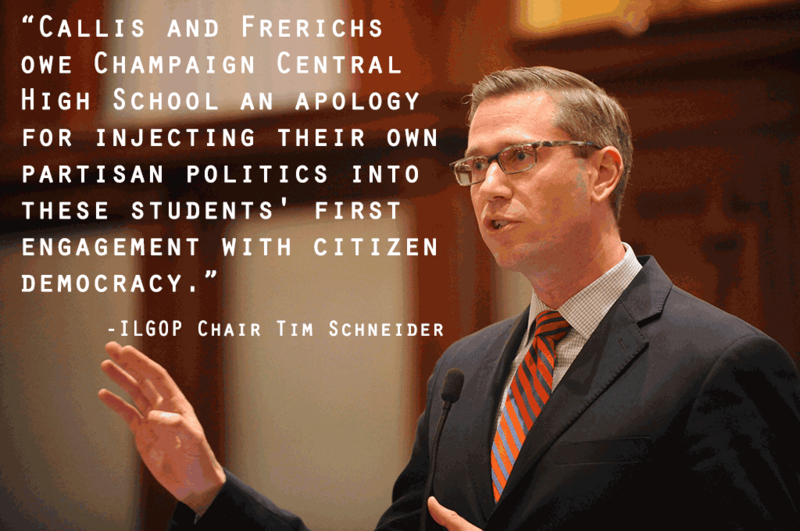 “Callis and Frerichs owe Champaign Central High School an apology for injecting their own partisan politics into these students' first engagement with citizen democracy,” said Tim Schneider, Chairman of the Illinois Republican Party. We couldn't agree more. This was a shameful move by desperate politicians. We'll be joining Chairman Schneider and launching a petition to call on these two to step and set the record straight.